You know when you get an oblong plate, it's going to be expensive! And so too was my Monkfish with a Praying Prawn, two Mussels, a Garlic and a few Spuds (nice though). It's also expensive on the autopista on the way to Barcelona. Sally chose a piece of Cheesecake with her coffee. Cake 4.25€ - and it wasn't even on an oblong plate! I'm only guessing, but I think this is one twelfth of a whole cake - total income 50.50€ less staff shrinkage, say 48€. Cost of cake 6, 7 or 8 euros? Profit margin= Huge. 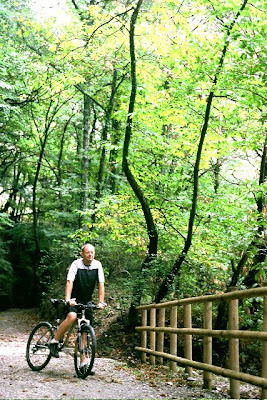 A trip round Spain's Vias Verdes on a Merlin Metalworks Titanium Newsboy Mountain Bike. lots of words, tap your space bar about 12 times to jump through this post. 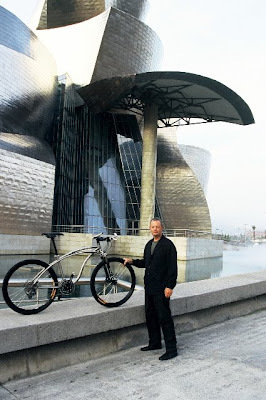 In September 2003 I bought a new bike, a very rare (only 100 ever made) Merlin Metalworks Titanium Newsboy mountain bike and wanting to giver it a good ride. Looking around for an interesting trip, I found an advert for a Magical Mystery Tour - a voyage round Spain's Vias Verdes. These Vias Verdes or Green Ways are old railway lines that have been converted to pathways and maintained for the pleasure of cyclists and walkers. So Sally and I signed up and took ourselves off to Spain. Day 1 - Sunday 5th October - Vía Verde de La Jara. Last night, we met up with the rest of the group in Madrid and were given a reception at the Spanish Railway Headquarters in the imposing Fernan Nuñez Palace where our tour was explained by Señor Joaquín Jiménez Otero, President of the European Greenways Association. A convivial dinner in a local restaurant, accommodation in a three star hotel. This morning we depart from Atocha railway station on a regional train. Our guide for the next two weeks is Alberto Hernandez Colorado - Tetto to his mates. An hour and a half later we arrive at Talavera de la Reina (Toledo). Then a short journey in a minibus, and we jump on our bikes to start the descent of the Vía Verde de La Jara through amazing mountains, great granite rocks and a spectacular viaduct over the Azután reservoir. The construction of this line was halted because of the Spanish Civil War and was never restarted, in fact the rails were never laid and so no train ever ran down this 52km route. There are several tunnels to negotiate, one I found ‘entertaining’ because it was quite long and unlit, but as I could see light at the far end I didn’t bother to unpack my headlamp. However, half way through the light from behind ran out and it became virtually pitch black. Trying to keep balance with nothing to relate to was a bit alarming, even more so as the sound under my wheels seemed to indicate that the grit was getting thicker. I must admit I unclipped my shoes and was ready to walk, but then the light from the far end began to penetrate and I made it through on two wheels. We stopped half way through the stage for a picnic lunch, Spanish style; bocerones (marinated anchovies), cepas (big, wild mushrooms), bacon and venison - with wine. To follow, thick slices of sweet melon and then very black coffee. Today was mostly dead straight with a good hard surface so quite an easy ride. The day ends at the railway station at Calera y Chozas where we climbed into the vans for the transfer to our hotel in Trujillo in the province of Cáceres. No riding today, we go to Seville with a stop to see the Roman theatre and amphitheater in Mérida. Last night in Trujillo was spectacular. The beautiful cobbled square in the mediaeval town centre was a perfect setting for another memorable meal and a nice hotel. On top of the church tower a stork was sitting on its nest. In fact, it comes back each year and adds another layer to its nest which is now estimated to weigh over a tonne. We go to Puerto Serrano (Cádiz) the start of the Vía Verde de la Sierra to Olvera, a 36 km route along the Guadalete River and through the unique Zaframagón Vulture Reserve. No need for suncream today as we have 27 tunnels to go through. Although we have been issued lights, all the tunnels are lit and have sensors which switch on the lights as we arrive at each entrance. As well as seeing the vultures wheeling overhead we pass a few goat farms with black and brown goats basking in the midday sun. We stop for another picnic lunch under an enormous oak said to be a thousand years old, which has been declared a National Monument, where we have the most amazing food delivered from a local restaurant. Big bowls of stews laid out on tables covered by white tablecloths and then delicious spicy meatballs and cabbage. 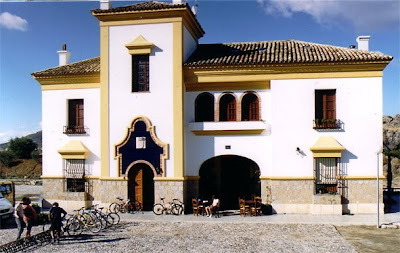 Despite the red wine we complete the ride to the former train Station of Olvera, which has been renovated as a rural hotel, where we are treated to jugs of manzanilla wine mixed with mint and lemonade. I thought I might get fit this holiday but already calories-in are exceeding calories-out. 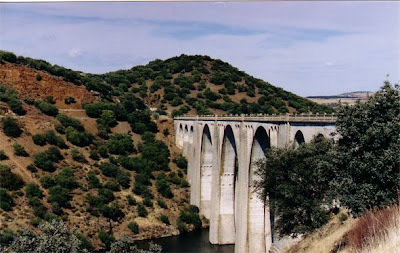 There are two sections of the Via Verde del Aciete totaling over 100km, but we have picked out the most recently made section of 48 km crossing an imposing countryside of olive trees and impressive 19th century metal viaducts, arriving at Alcaudete (Jaén). Lunch is in the former Luque Station, now renovated as a restaurant, where we are served paella, one of the few, if not only, time the food didn’t quite come up to scratch. Paella is a regional dish of the Mediterranean and here in Andalucia they didn’t get it quite right. Also the road surface isn’t quite right. Thick grit has been laid for most of the way, and while this would have been ‘bedded-in’ on most normal public roads by passing traffic, here on the greenway which is so little used, and then only by bikes, the grit is still loose. This makes for unpleasant and sometimes dangerous riding ploughing through gravel a couple of inches thick. 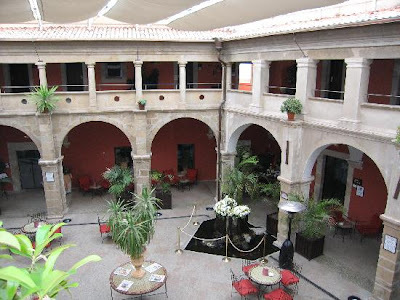 Last night we arrived in Granada and stayed in a hotel that is a former monastery. Today some of us look round town while I track down a local swimming pool and swim a steady mile. We all then visit the Alhambra, the famous Arabic palace and in the evening board an overnight hotel-train to Barcelona. A sort of no cycling day, although we ride up and down the Ramblas, look around the port and drink hot chocolate. In the afternoon we get into the vans and drive up to Gerona. Barcelona is the capital of Catalunya where most locals speak Catalan as well as Castillian Spanish, If you know some Castillian you can usually figure out what is being written in Catalan. The regions of Valencia and Mallorca have the same sort of language as Catalan, or a dialect of it, and the local governments of these regions use it as their official language. Up in the north-west of Spain in the Basque country, which is Pais Vasco and Navarra and bits of adjoining France, the language is Euskara and the region is known locally as Euskadi. This tongue is totally different from Castilliano and sounds to me a bit eastern European, going on Russian. In fact, about 30 of their words are exactly the same as those used in southern Turkey around the area of the Caucasus. Another Spanish region, Galicia in the far west, has Gallego as its language, which is the mother of Portuguese, and in Asturias there is a language called Bable which can sometimes be heard in rural areas. Regionalism, or some would say, Nationalism is very strong in Spain. Football matches between Barça and Madrid are infamous for the hatred vented by both sets of fans. When Luis Figo, an ex Barcelona player, came back to play with his new Madrid team at Barça’s Camp Nou stadium he received not only a hail of abuse, but a hail of projectiles, including coins, bottles, a few mobile phones and a bloody pigs head. During the time Franco was head of government all these regional languages were suppressed, but now they have been revived and are taught at all levels of school. Day 7 - Saturday - Vía Verde del Carrilet. We are taken up to Olot and ride the 54km from the foothills of the Pyrenees back to Gerona. This is the best riding day so far. The landscape is much greener with narrow tracks winding around fields of maize, some following the old railway but at other times deviating along well marked paths. The first 10km is uphill to the Col d’En Bas then it’s mostly downhill or flat to Gerona. In the evening we stroll around the lovely old town looking for Lance Armstrong’s house but end up in a bar, called the Celtic, showing the Turkey v England match on Sky TV. You know how in Britain, if you order a G&T, the gin is measured using an optic to dose the equivalent of a dessertspoon - well in Spain they don’t bother with measures. My theory is that the Spanish barman counts to seven as he glug-glugs the gin into your glass and you end up with the British equivalent of a triple. In the Celtic your man counts to ten (at least) and so, consequently, we became quite animated watching the match. To celebrate England’s 0-0 draw and topping of their group, we dined out on tapas in the town square. Day 8 - Vía Verde de Girona to Costa Brave - Down to the sea. Gerona to Sant Feliu de Guíxols on the Mediterranean coast and only 23km as we drive the first bit which, apparently, is a bit industrial. However the rest is far from it, being really beautiful, and we fly down the old railway line through lines of eucalyptus trees to Sant Feliu and lunch. You might think that a two week cycling holiday in October could be cold and damp but we only had one little bit of drizzle later on in the trip and today most of our group went for a swim in the sea (mind you, the sea was rather cold). After lunch we load up and have a four hour drive up to Tudela in Navarra. Day 9 - Vía Verde del Tarazonica and Vía Verde de Préjano and A Swim. Two vias to ride today. First the Tarazonica, mainly uphill, and then lunch in Tarazona. Second a fairly short ride on the Préjano down to our spa hotel in Arnedillo. The Tarazonica has a nice hard grit surface, bridges specially built to cross busy roads, well signposted, and what more can you say? It wasn’t exactly boring . . . . well, actually, it was. But I shouldn’t complain, a good few euros had been spent on it and the locals obviously used it a lot as we saw quite a few groups out walking the route. The Préjano on the other hand wasn’t dead straight, had some nice descents and interesting scenery and menacing dogs, fortunately behind a big fence. The only problem was that it was short, about 9km, so I left my Merlin in the van and ran the route. The last kilometer into Arnedillo had a long, long tunnel and while it was lit I didn’t know if the lights might switch off at any time so had to sprint the last 600 metres to be on the safe side. 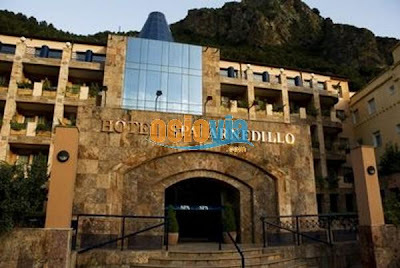 Not to worry, they stayed on and I ended up at he marvelous Arnedillo Spa Hotel. Firstly into the outdoor pool for a few lengths of front crawl and then indoors and into the spa for a very relaxing hour of water massage. Arnedillo is also one end of the Via Verde del Cidacos going down to Calahorra, but we didn’t get to ride it as next day we were going further north into the Basque country. Today we go deep into the forest from Uitzi to Andoain, not another human or road or village or anything, except trees, lots of trees. Oh yes! and tunnels. The book says 39 and it’s probably right. Previously our tunnels had been nice and dry and well paved and well lit (mostly). Today they were like going into long forgotten caves, wet, dank, black and probably the next location for part 4 of the Lord of the Rings. These tunnels were scary and even with lights I have to admit to a bit of walking. But this tour of Spain is all about seeing its differences and today was not like any other and despite the tunnels (or maybe because of them) it was fantastic. We’ve had straight rides, curvy rides, rides through flat lands and downhill rides through mountains, but today’s was completely different. Today we went right into the heart of the forest where only an ex-railway line could comfortably take us - and it was amazing, virgin forest free of any sign of human interference, even the path we rode was nicely aged and seemed to fit. And now for something completely different - we are off to Bilbao. Day 11 - Wednesday - Bilbao and the Guggenheim Museum. Seeing that the Guggenheim Museum and my Merlin Newsboy are both made from titanium I spent an hour taking some photos of the bike with the museum in the background. At one point clouds of steam came up from the lake in front of the museum and the night before I saw flames jetting out of little islands in the lake, so full marks to Mr Guggenheim for creating the occasional bit of kinetic art as well as an awesome piece of architecture. The exhibition was pretty good. We saw some impressive sculpture and I particularly liked the Photo and Moving Image exhibition on level 3. Having ‘done the Gug’ we were off to stay the night, a couple of hours up the road, in Santander in Cantabria. Our itinerary had said we were to ride the Via Verde del Pas, enjoying the Cantabrian mountains and the Peña Cabarga. However, the Pas is in fact two separate tracks with a town in the middle, so rather than spend time fighting the traffic, we had a leisurely ride round the headlands of Santander, and jolly nice they are too. Even nicer was the stop in a cafeteria for hot chocolate and churros. I had first gone to Spain when I was eight years old and had ‘Chocolate con Churros’ for breakfast every morning. When I got back to England I could never understand why the hot chocolate tasted of milk powder and not the lovely smooth rich chocolate that I had had in Spain. Years later I discovered that the Spanish version is not re-constituted powder but actual blocks of special chocolate, added to a little milk and then heated to melting point. The result is a thick, smooth, creamy, rich drink that adds another thousand calories to the days intake. But that’s not all, the Churros are deep fried bits of sweet batter, another million calories - what a luxury. Then we rode one of the bits of the Pas and apart from a few wet tunnels it wasn’t really memorable. This gives me a chance to mention our two van drivers who had been employed by the FFE to chauffeur us around Spain. Roman Bascuñana runs his own Serac outdoor adventure company. He takes climbers up mountains and pilgrims on the Camino de Compostella. Our other ‘main man’ Jesus Blazquez Sánchez, or ‘Chus’ as he is known, is the bike man. 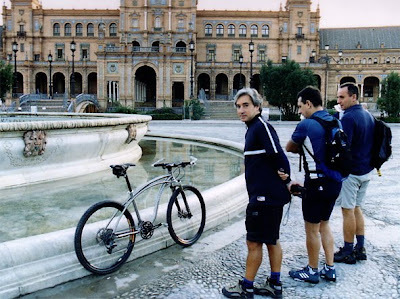 He supplied the bikes for everyone else on the tour and also organises his own tours and weekend breaks from his base in Madrid. So we finished our riding and transfered to Oviedo in Asturias for the night. Day 13 - Friday - Via Verde de la Senda del Oso - and a big blow out. Today we ride up a narrow leafy track, having first had a quick look at a of sort of safari park in Teverga which housed a sleepy jaguar, some ostriches and a rat. This used to be a mining area and the safari park was an old mine with all its surface machinery intact. It was closed in the eighties and only then on the condition that the miners were re-employed in the park. Further up the track is an enclosed area where two bears live. We got a bit confused when Alberto, our guide, was telling us that “two birds, that are sisters” lived there. His English was pretty good but he had a certain Spanish twang, so we got a bit lost in the translation. All was revealed when we saw the pair, and luckily just in time to see them take lunch, quite a lot of oranges if I remember correctly. I’ve not mentioned the lunches and dinners lately, they have all been first class, but today’s lunch was - historic! We ended up in a little village, San Martín de Teverga, and went into a very nondescript bar called Casa Laureano. We were taken through the kitchen to a back room and there served The Meal of the tour. First of all we had some little empanadillas, a sort of mini pastie, just to get us started we didn’t realise was this was only the first course and there was more to come. No sooner had the plates been cleared, and we had begun to think of coffee, than the main course arrived. Big knuckles of wild boar, Bonito a la plancha - a fish a bit like fresh tuna - and Picadillos, basically minced spicy chorizo sausage which had been deep fried. Phew! Well, we did our best but then when it was finally all over, dessert arrived. I had to have some of the rice pudding, rich, smooth with a taste of caramel, really superb. I managed to drink a teaspoon of black coffee before making my excuses and staggering out with a stomach so full it was painful. What a meal. In a daze we make it back to Oviedo, look round the shops and then board the night sleeper train to Madrid, the finishing line of our Vuelta de España. A terrific two weeks, we enjoyed ourselves immensely. A serious mountain biker might find it a bit tame and it was a bit too hard for the uninitiated in cycling holidays. However you can do sections of the two week tour and pick the bits that might suit you best. For more information the FFE web site is www.viasverdes.com. Our bike man Chus, who runs tours for mountainbikers throughout the year, is at www.rutaspangea.com. 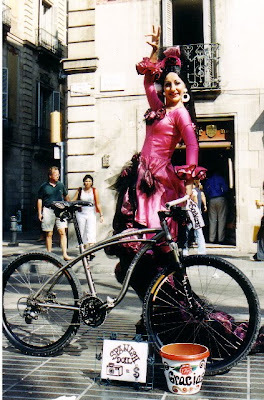 Fired up with enthusiasm for all things Via Verde we have since ridden the Via Verde de la Safor between Oliva and Gandia, a two day trip combining the Vias Verdes Serpis, Xixarra and Maigmó and a train ride up to Teruel to come back down the Vias Verdes de Ojos Negros (l) and (ll).